Hi guys!!!! I have been talking beauty with my girlfriends lately. We all seem to agree that mascara is a must have and go to item when it comes to makeup. I love a great mascara and today I wanted to share with you my some of my favorite mascaras that I recommend you check out. 1) Diorshow by Dior--- I love this mascara. It is a must have and a classic in my collection. 2) They're Real by Benefit-- I stumbled upon this at Ulta. It's a great for thickening lashes. 3) Lights, Camera, Lashes by Tarte -- My friend Nicole told me about this one. I have to say it could be my all time favorite. It lengthens and makes my lashes look fuller. I just love it!!! 4) Perversion by Urban Decay-- I have been obsessed with Urban Decay lately. My friend Diane from my Bar Method classes was kind enough to share some items with me (her daughter in law is the creator) and now I'm hooked. 5) Subversion by Urban Decay-- I love this because it is a conditioning mascara that I have been using before I put on any mascara. It really lengthens my lashes. 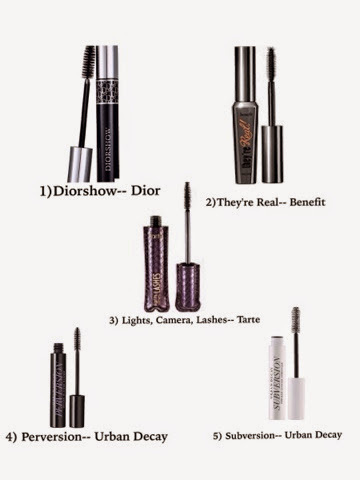 So try some of these mascaras out and let me know what you think. Which is your favorire? Leave a comment for me!!! And don't forget to follow me on Instagram, Facebook, Twitter and Bloglovin. Happy reading!!!! Hi guys!!!! 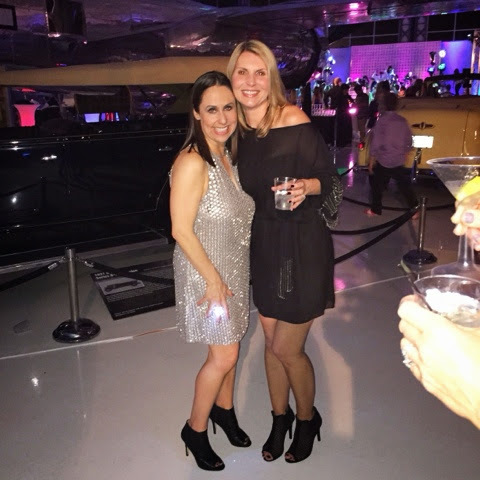 I went to some amazing parties over the last few weeks. 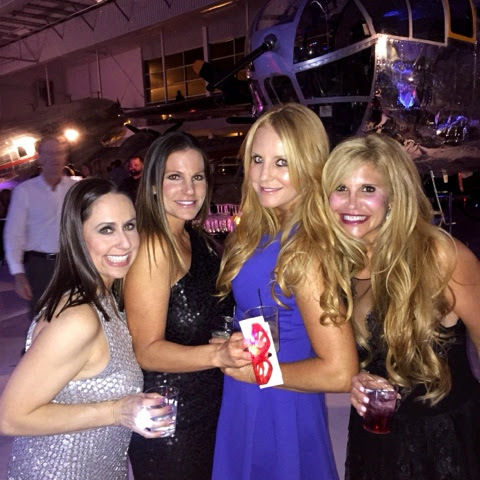 I wanted to share some great pictures from two parties I attended both in Los Angeles and Newport Beach. 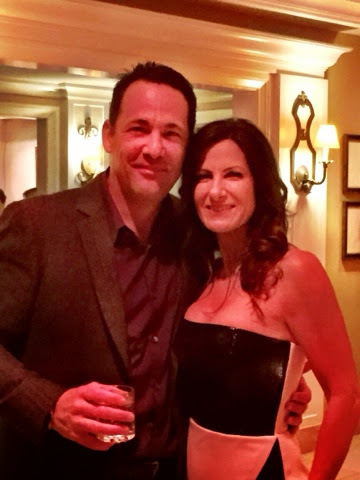 I decided to wear a Parker NY dress to each event. I love the line Parker NY. It is my go to for more formal occasions. What I love about Parker NY is that many of the pieces are beaded and sequin dresses. You all know how much I love sparkle and these dresses are so cool and edgy. I recommend that if you have any dressier events coming up to check out Parker NY. There are many different styles of dresses that come in beaded and non beaded versions. Let me know what you think. 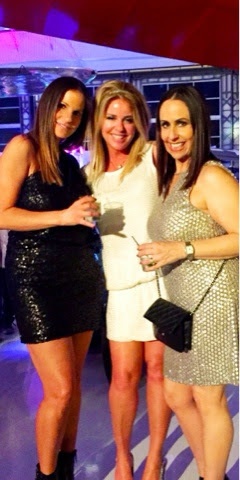 And I must say, how amazing do my fabulous girlfriends look? I love showing you all how proud I am of my girlfriends and how much effort they put into their style. I feel that each of their outfits reflect their own individual style. I love how my girls take fashion risks and look incredible doing it . Thanks to Cathy Cordas for photo editing, and don't forget to follow me on Instagram, Facebook, Twitter and Bloglovin. Happy reading!!!!! Hi guys!!!!! Happy Monday. 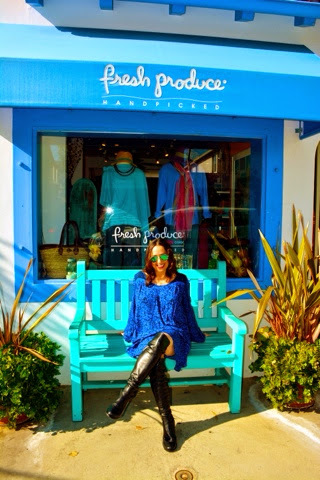 Cathy and I did a photo shoot on beautiful Balboa Island for an upcoming OC Register article. I love the Island. It is so quaint. I love all the shops!!! 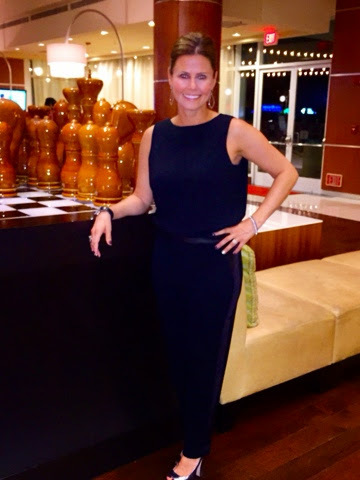 I wore this great dress from the Brass Plum Department at Nordstrom. 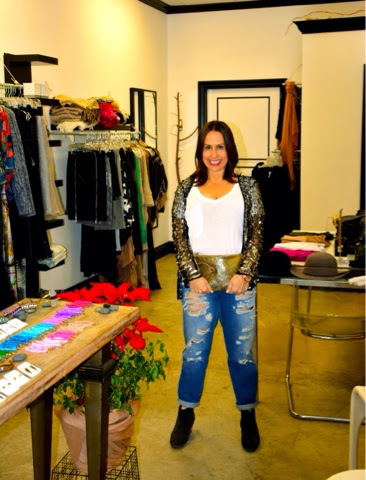 I sometimes shop in Brass Plum, even though it is geared towards a younger crowd. Sometimes you can find a gem. I was immediately drawn to it because of the amazing blue color and cool print. And since I'm only 5'2", shorter hem dresses are perfect for me. It is one of the most comfortable dresses I own!! I love pairing these shorter dresses with tall boots. Right now I'm obsessed with over the knee boots. This combination of the shorter dress and over the knee boots is current and on trend. I highly recommend checking out the Brass Plum from time to time. You never know what you might find. And try this dress and boot combination. It's easy and effortless. Let me know what you think!!! Thanks to Cathy Cordas for photos and don't forget to follow me on Instagram, Facebook, Twitter and Bloglovin. Happy reading!!!! Hi guys!!!! I know what you are thinking. A sweater dress? Really? It seems so 80's. But let me share with you that the sweater dress is back. I love this version from Topshop. 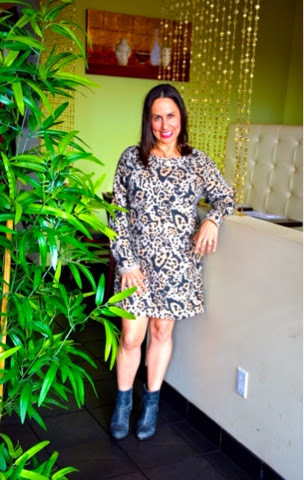 The animal print is fun, edgy and comfortable. 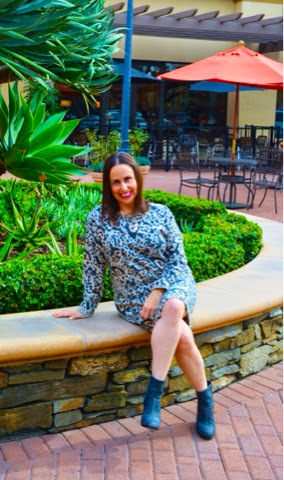 The sweater dress can be worn by all body types. Whether you are tall or short you can pull off this look. 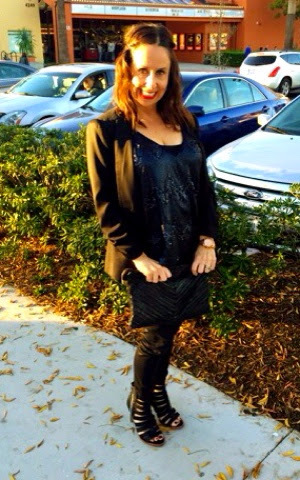 I paired it with my favorite Rag and Bone heeled booties. You can also add tights and tall boots to change up the look. I recommend that you look into the sweater dress trend and give it a try. Let me know what you think. 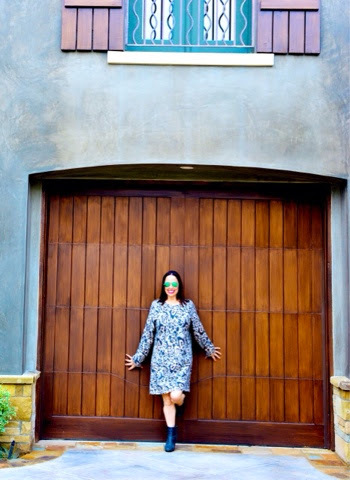 Thanks to Cathy Cordas for photos and don't forget to follow me on Instagram, Facebook, Twitter and Bloglovin. Happy reading!!!! Hi guys!!!! 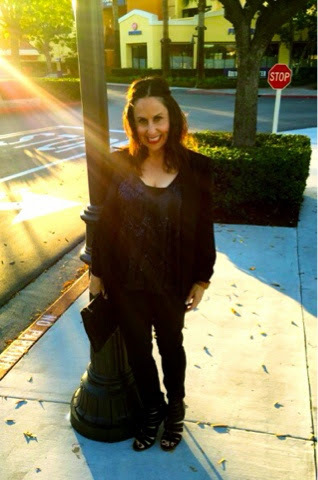 I am loving that we are finally having winter weather here in Newport Beach. When I think of winter I think of wearing black. For some reason the color black and dark rainy winter days and nights go together. 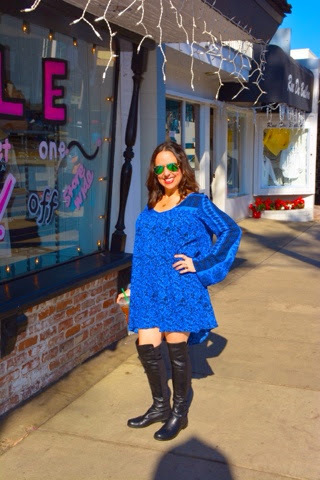 I wanted to share with you adding other colors besides black into your winter wardrobe, and blue is a great option. I love the combination of black and blue. 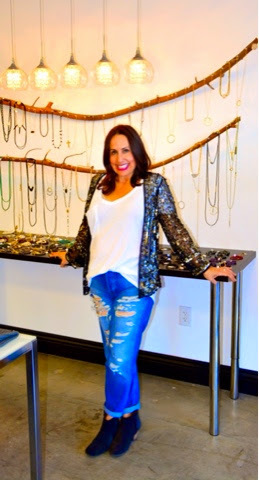 Here I'm wearing a sparkly blue tank top by Honey Punch, paired with my Paige black coated jeans, my favorite blazer and black open toed booties. The blue adds a little special something to an ordinary black outfit. 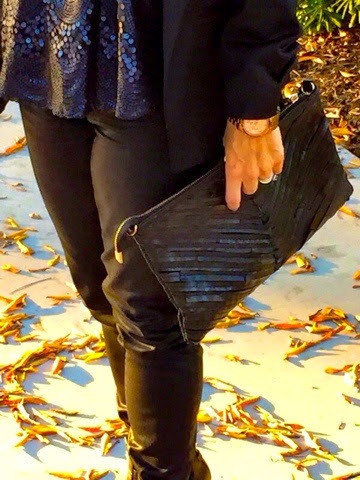 I also love this black clutch. 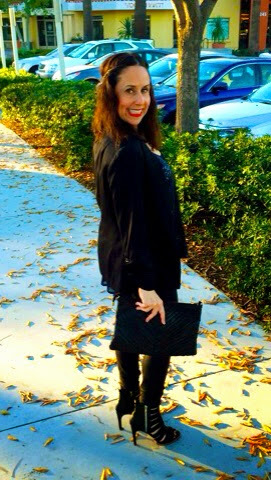 I think a simple black clutch is a perfect addition to your evening outfit. It's the perfect accompaniment for your lipstick, phone and money. So try this black and blue combination and let me know how you wear these colors together!!! I'd love hearing from you. Thanks to Cathy Cordas for photo editing. Don't forget to follow me on Instagram, Facebook, Twitter and Bloglovin. Happy reading!!! Hi guys!!!! 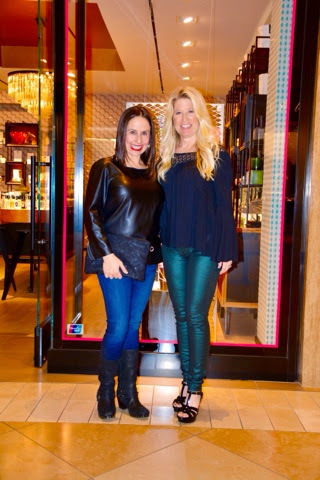 I am excited to share with you a great event my girlfriends and I just attended for Julie's birthday at my favorite candle and fragrance store -- Diptyque. Diptyque is a Paris based company that produces scented candles, perfumes and face and body care. 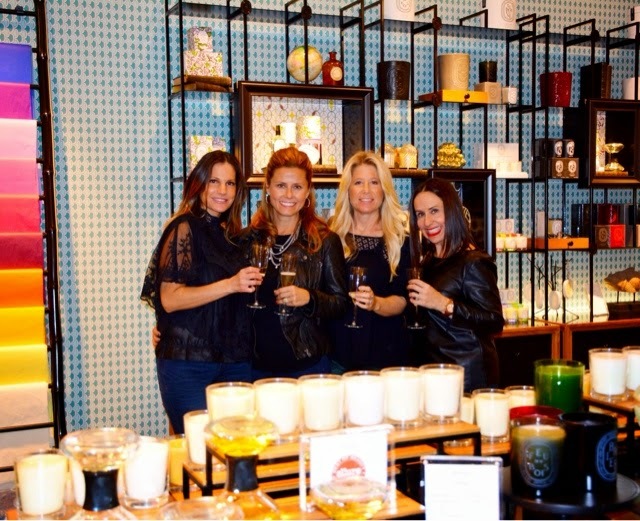 Although Diptyque products are found in department stores like Nordstrom and Bloomingdales, an actual Diptyque store recently opened at South Coast Plaza. 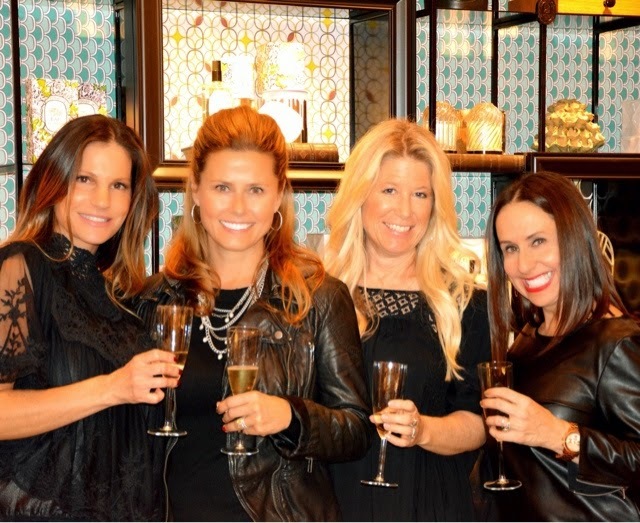 We were lucky enough to be invited to a champagne event at the new store where we sampled all the newest scents. We had a great time!!!! 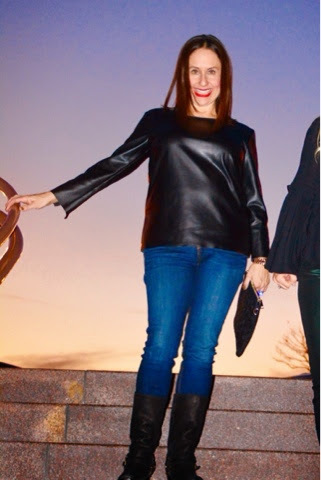 I decided to wear a faux leather shirt with skinnies and my Miu Miu boots (that I purchased at Bloomingdales a few years ago). I love this look. It is current and chic. 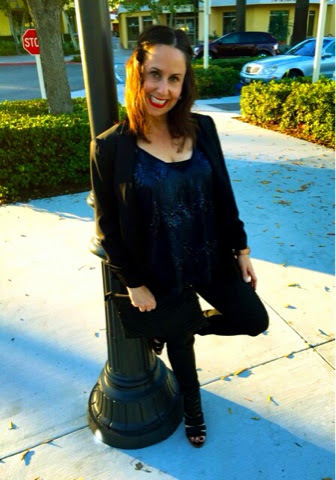 A faux leather shirt is a great alternative to a faux leather or fur vest. We had the best time smelling all the incredible candles and fragrances. Thanks so much Diptyque!!! 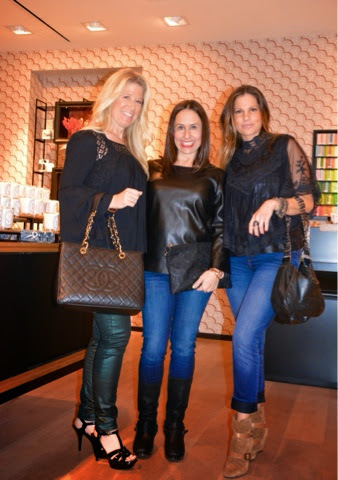 We loved spending our evening with you and especially loved the goody bags and our purchases. You should all invest in a Diptyque product. You won't be disappointed!!! Thanks to Cathy Cordas for photos and don't forget to follow me on Instagram, Facebook, Twitter and Bloglovin. Happy reading!!! Hi guys!!!! I just love sparkles. Lately, I have been wearing sparkles during the day. This Kate Moss for Topshop is a great sequin jacket that I usually wear at night. 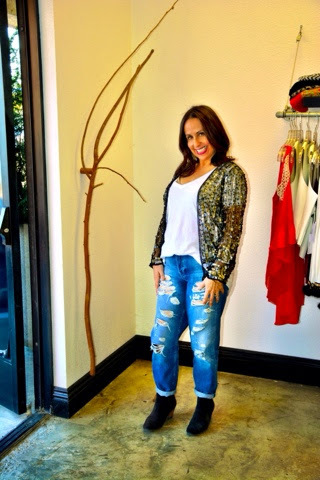 I dressed it down by adding a simple white tshirt, distressed boyfriend jeans and black booties. I suggest trying new trends and stepping outside of your comfort zone with fashion. This is a perfect example. By combining this dressier jacket with distressed boyfriend jeans and a basic white tshirt, this look becomes much more funky and trendy. I recommend that you try changing up your looks by adding a dressier piece to your daytime wardrobe. Let me know what you think!!! I would love to hear from you in the comments section. Thanks to Cathy Cordas for photos and don't forget to follow me on Instagram, Facebook, Twitter and Bloglovin. Happy reading!!!!! Hi guys!!!! I am absolutely obsessed with this hairstyle-- The LOB. It is a longer version of the bob. The length can range anywhere from below the chin to just above the collarbone. My hairstylist and one of my best friends Rita Miles at Salon 359 just gave me this cut and I LOVE it. It is so easy to style. Obviously these lovely ladies shown above love this style as much as I do and they look fabulous wearing it. Check this look out and let me know what you think!!! Don't forget to follow me on Instagram, Facebook, Twitter and Bloglovin. Happy reading!!!! Hi guys!!! 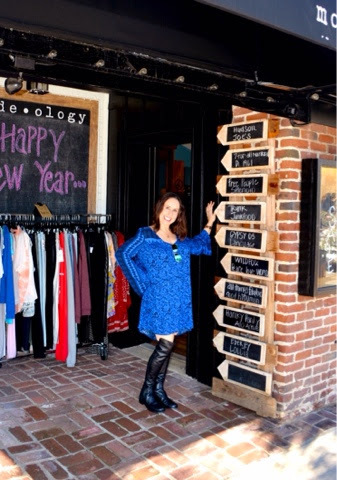 Everything Evelyne was featured in the OC Register on Sunday January 4th for Costa Mesa Street Style. Cathy and I visited the Newport Mesa Plaza in Eastside Costa Mesa and found these lovely ladies looking stylish. 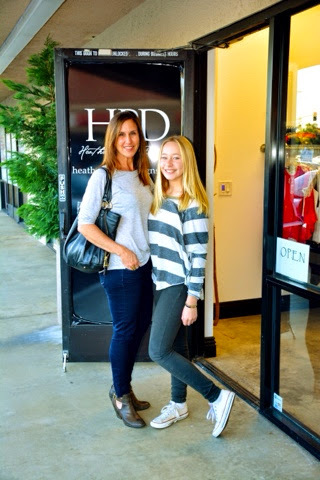 We found Heather Pullis, owner of the adorable boutique Heather Pullis Designs, in a Bishop and Young vest, Genetic Denim jeans, a black cozy shirt, Donald Pliner boots and jewelry by Heather Pullis. 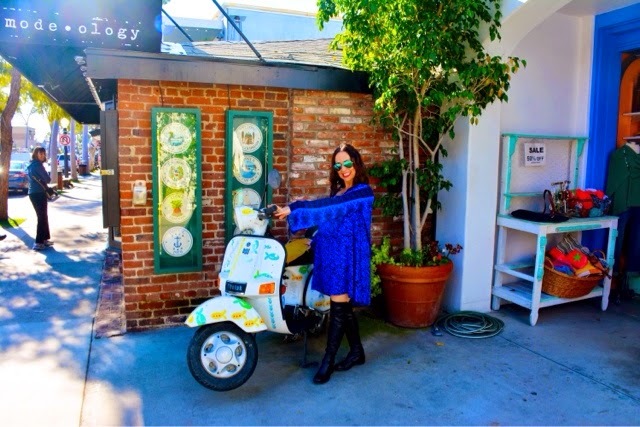 We found Tabitha Goff looking ever so stylish in front of the Beach Hut Deli wearing a Honeypunch sweater, Leatherette leggings, a Heather Pullis sheer shirt and been, Stuart Weitzman black boots, and amazing Celine sunglasses. We found the beautiful Grace Becker in front of Bonzai Bowl. 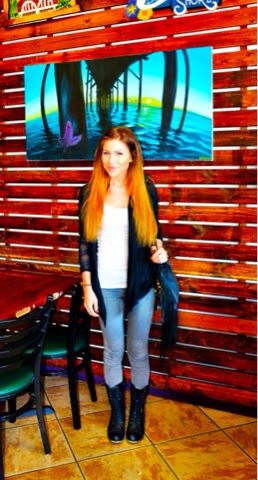 She is wearing a white tank, a black cardigan, grey J Brand jeans, Steve Madden black boots and a great Cut and Paste fringed black bag. 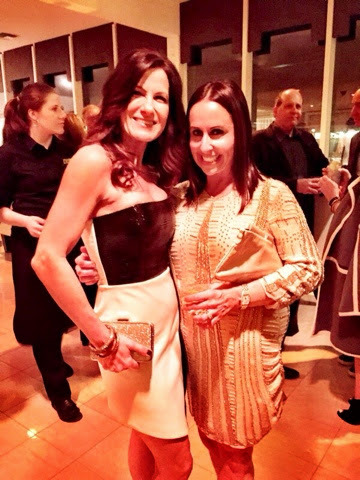 We spotted this mother daughter duo of Ann and Rachel Lemmon. Ann is wearing a Vince shirt, Paige jeans, Mia booties, an Aimee Kesterberg bag and HP ring. Rachel is wearing a striped Billabong shirt, Zara jeans and Converse Tennis shoes. 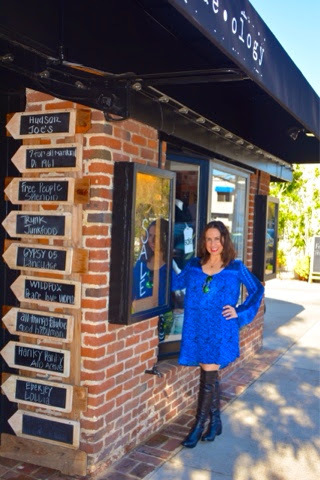 We found Ariel Donley coming out of the dressing room at Heather Pullis Designs wearing a fabulous electric blue HP dress. to spot more stylish looks around town. Thanks to Cathy Cordas for photos!!! And don't forget to follow me on Instagram, Facebook, Twitter and Bloglovin. Happy reading!! !